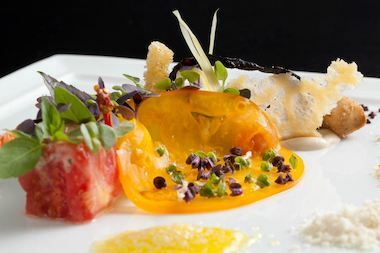 A tomato dish at Lincoln Park's Alinea, which was bestowed the Michelin Guide's highest three-star rating. DOWNTOWN — Chicago has been named the Restaurant City of the Year. The honor was bestowed on the city by popular foodie magazine Bon Appétit on Tuesday. Julia Kramer, a special projects editor at the magazine, ate more than 1,000 meals across 40 U.S. cities to find the country's "restaurant city." A few of Kramer's highlights in the city: the "pleasurable" yet "visually arresting" desserts at Elske; the way Fat Rice has reinvented Chicago-style hot dogs; Alinea's recent reboot; and the mezcal options at eateries like Quiote and Estereo. Bon Appétit also named four Chicago restaurants as finalists for its list of the best new restaurants in the United States. Though the restaurant hasn't yet named which restaurants will make the list, it said two of them will be from Chicago.